Your vehicle is designed primarily as a passenger-and-load-carrying vehicle. Towing a trailer can have an adverse impact on handling, performance, braking, durability, and fuel consumption. For your safety and the safety of others, you must not overload your vehicle or trailer. You must also ensure that you are using appropriate towing equipment, that the towing equipment has been installed correctly and used properly, and that you employ the requisite driving habits. Vehicle-trailer stability and braking performance are affected by trailer stability, brake performance and setting, trailer brakes, the hitch and hitch systems (if equipped). To tow a trailer safely, use extreme care and drive the vehicle in accordance with your trailer’s characteristics and operating conditions. Toyota warranties do not apply to damage or malfunction caused by towing a trailer for commercial purposes. Contact your Toyota dealer for further information about additional requirements such as towing kits, etc. The maximum allowable gross combination weight. The gross combination weight is the sum of the total vehicle weight (including the occupants, cargo and any optional equipment installed on the vehicle) and the weight of the trailer being towed (including the cargo in the trailer). The maximum allowable gross vehicle weight. The gross vehicle weight is the total weight of the vehicle. When towing a trailer, it is the sum of the vehicle weight (including the occupants, cargo and any optional equipment installed on the vehicle) and the tongue weight. The maximum allowable gross axle weight. The gross axle weight is the load placed on each axle (front and rear). The maximum allowable gross trailer weight. The gross trailer weight is the sum of the trailer weight and the weight of the cargo in the trailer. TWR is calculated assuming base vehicle with one driver, one front passenger, towing package (if available), hitch and hitch systems (if required). Additional optional equipment, passengers and cargo in the vehicle will reduce the trailer weight rating so as not to exceed GCWR, GVWR and GAWR. If the gross trailer weight exceeds 3000 lb. (1360 kg), it is recommended to use a trailer with 2 or more axles. The trailer weight rating for towing a trailer without a trailer service brake system. The load placed on the trailer hitch ball. ● The gross trailer weight must never exceed the TWR described in the table. 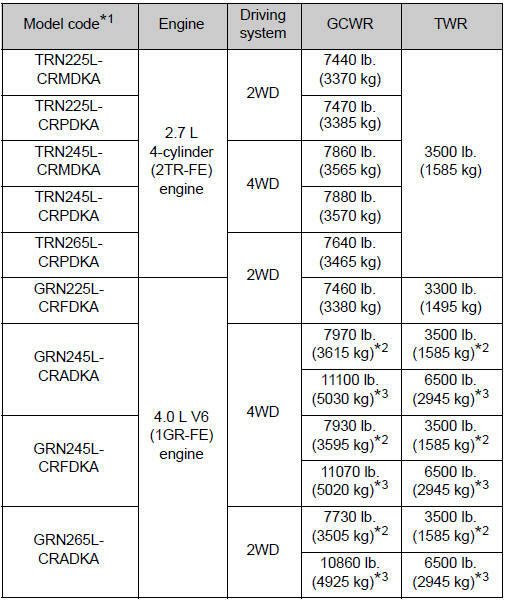 ● The gross combination weight must never exceed the GCWR described in the table. ● The gross vehicle weight must never exceed the GVWR indicated on the Certification Label. ● The gross axle weight on each axle must never exceed the GAWR indicated on the Certification Label. 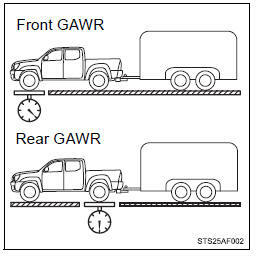 ● If the gross trailer weight is over the unbraked TWR, trailer service brakes are required. ● If the gross trailer weight is over 2000 lb. (905 kg), a sway control device with sufficient capacity is required. ● If the gross trailer weight is over 5000 lb. (2265 kg), a weight distributing hitch with sufficient capacity is required. Confirm that the gross trailer weight, gross combination weight, gross vehicle weight, gross axle weight and tongue weight are all within the limits. *: These models meet the tow-vehicle trailering requirement of SAE International per SAE J2807. *1: The model code is indicated on the Certification Label. Toyota does not recommend fifth wheel and gooseneck towing. ● A recommended tongue weight varies in accordance with the types of trailers or towing as described below. ● To ensure the recommended values shown below, the trailer must be loaded by referring to the following instructions. If front axle weight cannot be measured directly, measure the front fender height above the front axle before connection. Adjust weight distributing hitch torque until front fender is returned to the same height as before connection. Trailer hitch assemblies have different weight capacities. Toyota recommends the use of Toyota hitch/bracket for your vehicle. For details, contact your Toyota dealer. ● If you wish to install a trailer hitch, contact your Toyota dealer. ● Use only a hitch that conforms to the gross trailer weight requirement of your vehicle. ● Follow the directions supplied by the hitch manufacturer. ● Lubricate the hitch ball with a light coating of grease. ● Remove the trailer hitch whenever you are not towing a trailer. 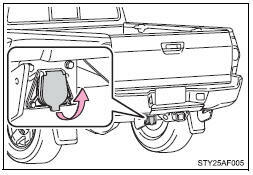 After removing the hitch, seal any mounting hole in the vehicle body to prevent entry of any substances into the vehicle. The rear bumper of your vehicle is equipped with a hole to install a trailer ball. If you have any questions, contact your Toyota dealer. The gross trailer weight (trailer weight plus cargo weight) when towing with the bumper must never exceed the TWR (→P. 228, 529) or 3500 lb. (1585 kg) whichever is lower. 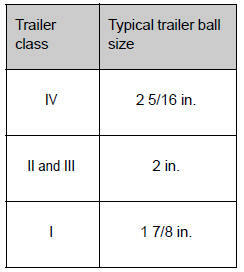 Use the correct trailer ball for your application. Matches or exceeds the gross trailer weight rating of the trailer. Matches the size of the trailer coupler. Most couplers are stamped with the required trailer ball size. Protrudes beyond the bottom of the lock washer and nut by at least 2 threads. Matches the ball mount hole diameter size. Weight carrying ball position: 56.1 in. Use the wire harness stored in the rear end under the vehicle body. Please consult your dealer when installing trailer lights, as incorrect installation may cause damage to the vehicle’s lights. Please take care to comply with your state’s laws when installing trailer lights. Your vehicle is equipped with a service connector for the trailer brake controller as shown. Your vehicle will handle differently when towing a trailer. Help to avoid an accident, death or serious injury, keep the following in mind when towing: ● Speed limits for towing a trailer vary by state or province. Do not exceed the posted towing speed limit. ● Toyota recommends that the vehicle-trailer speed limit is 65 mph (104 km/h) on a flat, straight, dry road. Do not exceed this limit, the posted towing speed limit or the speed limit for your trailer as set forth in your trailer owner’s manual, whichever is lowest. Instability of the towing vehicle-trailer combination (trailer sway) increases as speed increases. Exceeding speed limits may cause loss of control. ● Before starting out, check the trailer lights, tires and the vehicletrailer connections. Recheck after driving a short distance. ● Practice turning, stopping and reversing with the trailer attached in an area away from traffic until you become accustomed to the feel of the vehicle-trailer combination. ● Reversing with a trailer attached is difficult and requires practice. Grip the bottom of the steering wheel and move your hand to the left to move the trailer to the left. Move your hand to the right to move the trailer to the right. (This is generally opposite to reversing without a trailer attached.) Avoid sharp or prolonged turning. Have someone guide you when reversing to reduce the risk of an accident. ● As stopping distance is increased when towing a trailer, vehicle-tovehicle distance should be increased. For each 10 mph (16 km/h) of speed, allow at least one vehicle and trailer length. ● Avoid sudden braking as you may skid, resulting in the trailer jackknifing and a loss of vehicle control. This is especially true on wet or slippery surfaces. ● Avoid jerky starts or sudden acceleration. ● Avoid jerky steering and sharp turns, and slow down before making a turn. ● Note that when making a turn, the trailer wheels will be closer than the vehicle wheels to the inside of the turn. Compensate by making a wider than normal turning radius. ● Slow down before making a turn, in cross winds, on wet or slippery surfaces, etc. Increasing vehicle speed can destabilize the trailer. ● Take care when passing other vehicles. Passing requires considerable distance. After passing a vehicle, do not forget the length of your trailer, and be sure you have plenty of room before changing lanes. ● To maintain engine braking efficiency and charging system performance when using engine braking, do not use fifth gear (5-speed manual transmission), sixth gear (6-speed manual transmission), or do not put the transmission in D (automatic transmission). ● Instability happens more frequently when descending steep or long downhill grades. Before descending, slow down and downshift. Do not make sudden downshifts while descending steep or long downhill grades. ● Avoid holding the brake pedal down too long or applying the brakes too frequently. This could cause the brakes to overheat and result in reduced braking efficiency. ● Due to the added load of the trailer, your vehicle’s engine may overheat on hot days (at temperatures over 85°F [30°C]) when driving up a long or steep grade. If the engine coolant temperature gauge indicates overheating, immediately turn off the air conditioning (if in use), pull your vehicle off the road and stop in a safe spot. Apply the brakes and keep them applied. Have someone place wheel blocks under both the vehicle’s and trailer’s wheels. When the wheel blocks are in place, release the brakes slowly until the blocks absorb the load. Shift into P (automatic transmission) or 1 or R (manual transmission) and turn off the engine. With the transmission in P (automatic transmission) or the clutch pedal (manual transmission) depressed, start the engine. On vehicles with an automatic transmission, be sure to keep the brake pedal depressed. Shift into a forward gear. If reversing, shift into R.
Release the parking brake (and also the brake pedal on vehicles with an automatic transmission), and slowly pull or back away from the wheel blocks. Stop and apply the brakes. Have someone retrieve the blocks. No matter which class of tow hitch applies, for a more safe trailer hookup, the trailer ball setup must be the proper height for the coupler on the trailer. ●Trailer tires are inflated according to the trailer manufacturer’s recommendation. ●All trailer lights work as required by law. ●All lights work each time you connect them. ●The trailer ball is set at the proper height for the coupler on the trailer. ●The trailer is level when it is hitched. Do not drive if the trailer is not level, and check for improper tongue weight, overloading, worn suspension, or other possible causes. ●The trailer cargo is securely loaded. ●The rear view mirrors conform to all applicable federal, state/provincial or local regulations. If they do not, install rear view mirrors appropriate for towing purposes. If your vehicle is new or equipped with any new power train components (such as an engine, transmission, differential or wheel bearing), Toyota recommends that you do not tow a trailer until the vehicle has been driven for over 500 miles (800 km). After the vehicle has been driven for over 500 miles (800 km), you can start towing. However, for the next 500 miles (800 km), drive the vehicle at a speed of less than 50 mph (80 km/h) when towing a trailer, and avoid full throttle acceleration. ●If you tow a trailer, your vehicle will require more frequent maintenance due to the additional load. (See “Owner’s Warranty Information Booklet” or “Scheduled Maintenance Guide/Owner’s Manual Supplement”.) ●Retighten the fixing bolts of the towing ball and bracket after approximately 600 miles (1000 km) of trailer towing. One or more factors (crosswinds, passing vehicles, rough roads, etc.) can adversely affect handling of your vehicle and trailer, causing instability. ●If trailer swaying occurs: • Firmly grip the steering wheel. Steer straight ahead. Do not try to control trailer swaying by turning the steering wheel. • Begin releasing the accelerator pedal immediately but very gradually to reduce speed. Do not increase speed. Do not apply vehicle brakes. ●After the trailer swaying has stopped: • Stop in a safe place. Get all occupants out of the vehicle. • Check the tires of the vehicle and the trailer. • Check the load in the trailer. Make sure the load has not shifted. Make sure the tongue weight is appropriate, if possible. • Check the load in the vehicle. Make sure the vehicle is not overloaded after occupants get in. If you cannot find any problems, the speed at which trailer swaying occurred is beyond the limit of your particular vehicle-trailer combination. Drive at a lower speed to prevent instability. Remember that swaying of the towing vehicle-trailer increases as speed increases. To tow a trailer safely, use extreme care and drive the vehicle in accordance with the trailer’s characteristics and operating conditions. Failure to do so could cause an accident resulting in death or serious injury. Vehicle stability and braking performance are affected by trailer stability, brake setting and performance, and the hitch. Your vehicle will handle differently when towing a trailer. 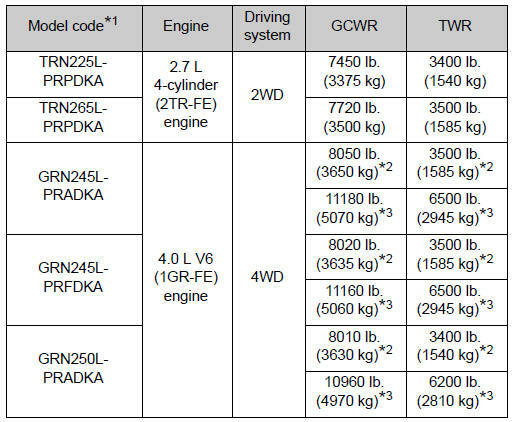 ●Do not exceed the TWR, unbraked TWR, GCWR, GVWR or GAWR. ●If the gross trailer weight is over 2000 lb. (905 kg), a sway control device with sufficient capacity is required. ●If the gross trailer weight is over 5000 lb. (2265 kg), a weight distributing hitch with sufficient capacity is required. ●Adjust the tongue weight within the appropriate range. Place heavier loads as close to the trailer axle as possible. ●Do not exceed 65 mph (104 km/h), the posted towing speed limit or the speed limit for your trailer as set forth in your trailer owner’s manual, whichever is lowest. Slow down sufficiently before making a turn, in cross winds, on wet or slippery surface, etc. to help avoid an accident. If you experience a vehicle-trailer instability from reducing a certain speed, slow down and make sure you keep your vehicle speed under the speed of which you experience the instability. ●Do not make jerky, abrupt or sharp turns. ●Do not apply the brakes suddenly as you may skid, resulting in jackknifing and loss of vehicle control. This is especially true on wet or slippery surfaces. ●Do not exceed the trailer hitch assembly weight, gross vehicle weight, gross axle weight and trailer tongue weight capacities. ●Do not use cruise control when towing. ●Slow down and downshift before descending steep or long downhill grades. Do not make sudden downshifts while descending steep or long downhill grades. ●Vehicle-trailer instability is more likely on steep long downhills. Before descending steep or long downhill grades, slow down and downshift. Do not make sudden downshifts when descending steep or long downhill grades. Avoid holding the brake pedal down too long or applying the brakes too frequently. This could cause the brakes to overheat and result in reduced braking efficiency. ●Do not tow a trailer when the temporary spare tire is installed on your vehicle. Trailer hitch assemblies have different weight capacities established by the hitch manufacturer. Even though the vehicle may be physically capable of towing a higher weight, the operator must determine the maximum weight rating of the particular hitch assembly and never exceed the maximum weight rating specified for the trailer-hitch. Exceeding the maximum weight rating set by the trailer-hitch manufacturer can cause an accident resulting in death or serious personal injuries. Toyota recommends trailers with brakes that conform to any applicable federal and state/provincial regulations. ●If the gross trailer weight exceeds unbraked TWR, trailer brakes are required. Toyota recommends trailers with brakes that conform to all applicable federal and state/provincial regulations. ●Never tap into your vehicle’s hydraulic system, as this will lower the vehicle’s braking effectiveness. ●Never tow a trailer without using a safety chain securely attached to both the trailer and the vehicle. If damage occurs to the coupling unit or hitch ball, there is danger of the trailer wandering into another lane. Use only the position recommended by your Toyota dealer. Do not install the trailer hitch on the bumper; this may cause body damage. Do not directly splice trailer lights. Directly splicing trailer lights may damage your vehicle’s electrical system and cause a malfunction. Your vehicle is not designed to be dinghy towed (with 4 wheels on the ground) behind a motor home. Do not tow your vehicle with four wheels on the ground.